Indoor cats must always stay indoors! Not true. 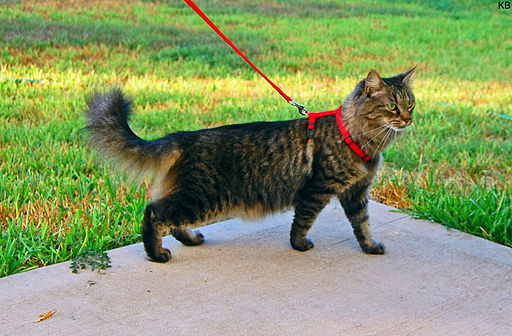 Many pet parents have found that walking cats provides enrichment that cannot be equalled. Sure, watching birds, squirrels and lizards through the window is okay but allowing them the opportunity to breath and smell the fresh air brings far greater joy. Plus, it’s an experience that feline and human can engage in together. It strengthens their bond, an unbreakable bond. Although it’s not very common that you’ll actually see a cat being walked, sometimes they participate in other “unusual” activities, too. There are kitties that go hiking. Others enjoy a little swim in the pool. It’s all up to the creativity of the cat guardian to experiment and find ways to stimulate their pet. The relatively effortless act of walking enriches feline lives. It’s worth remembering that both physical and mental exercise prevent boredom and help keep them in good health, as well. It allows them to thrive, not just be. Before your cat companion ventures beyond your front door, make sure you have everything it needs to be safe and comfortable. As you know by now, I do not take chances. So, if Fluffy tolerates wearing a collar that displays her ID, make sure she is wearing it while on her trip into the big, wide world. Please ensure it is the breakaway type so that it will unfasten if she were to ever get caught up or tangled. That way, she can free herself and avoid further injury. 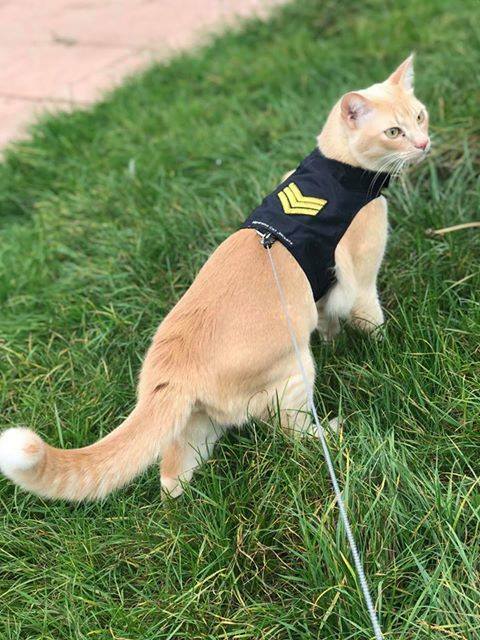 Since cats are far more delicate than dogs, it is never advisable to try walking her with the leash attached to a collar. 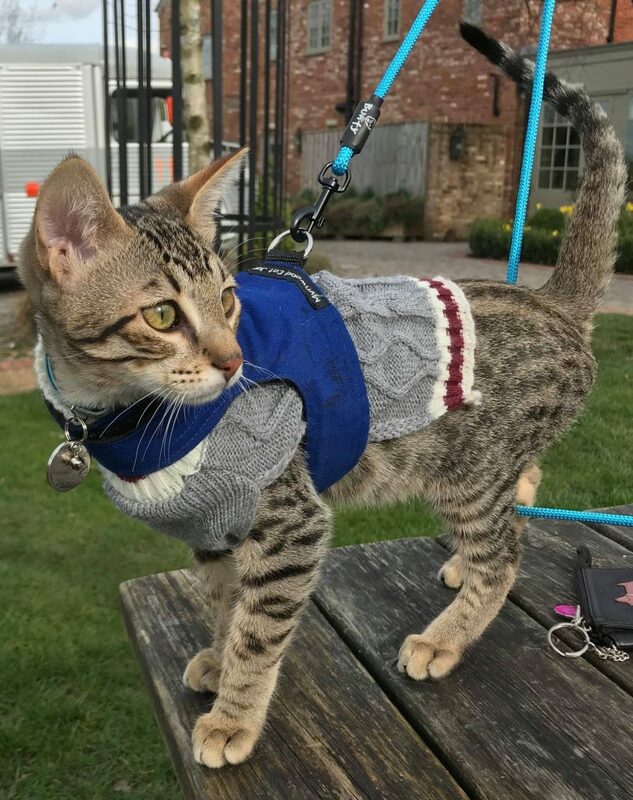 There are special harnesses just for cats and the leash will clip onto the ring between the shoulders or a little further down the back. 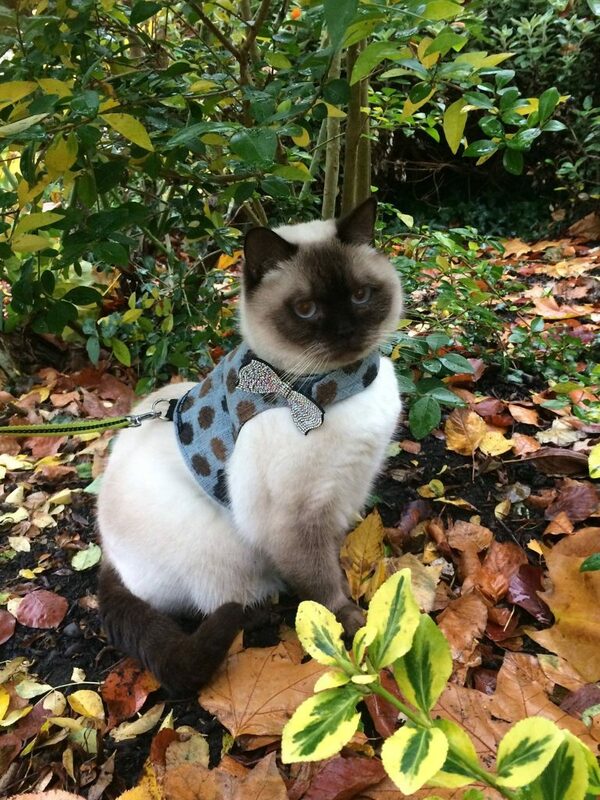 There are two basic styles of harnesses for cats. Firstly, we have the fabric, vest-type design, that is usually made of soft mesh. It slips over the head, passes underneath the chest, behind the front legs and two side straps snap together between the shoulders. Then there is the one that is all straps. It is actually two loops that are joined together by a strap that rests on the cat’s upper back. The straps that form the neck loop and the girth loop are positioned and then snapped in place. Now, if you strongly believe that walking cats provides enrichment and you want to give it a try, ideally you should start in kittenhood. To begin with, the youngster will need to learn to accept a harness, firstly indoors and then outside. Try it out for just a few minutes and then gradually build up to longer periods. Getting used to how the harness feels and walking at the end of a leash requires practice. This will help to minimize any possible stress and reluctance, and ensure it becomes an experience to look forward to. 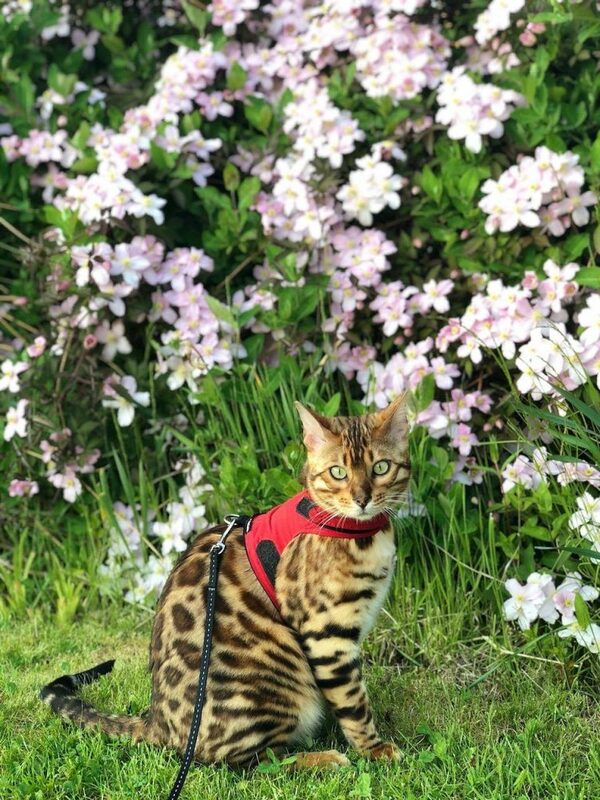 However, you need to realize that not all cats like wearing a harness. The older they are when they are first introduced to it, the greater the likelihood that your feline friend will refuse to wear one. You simply won’t know how she will react until you try. Most indoor cats never have the opportunity to go outdoors. They can only imagine what it’s like by staring at the outside through a window from the inside. An indoor cat can benefit greatly from these walks. It is really great exercise. She will stay agile and in her optimum weight. It will stimulate her senses, serve as enrichment, and make her a very happy kitty indeed! So, what are the options available to pet parents with a dog that is reactive on leash? A head collar is just one of them. But you need to use head collars cautiously. Also known as a gentle leader, this tool needs to be introduced with a lot of care and patience so that Fido does not become fearful. It’s only fair for me to start off by saying that I have not yet met a dog that likes being fitted with one. My experience is that at the outset, dogs will usually show some degree of resistance. However, that uncertainty is soon short-lived because of the overwhelming desire to go walkies! The loop fits over the snout and two straps snap together on the back of the neck. It needs to fit snugly but never too tight. A dog still needs to be able to open its mouth sufficiently to allow for panting. 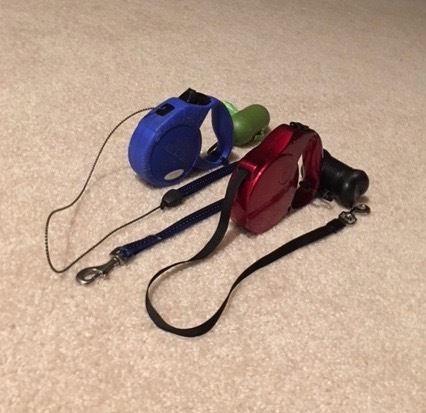 The ring for connecting the leash is located on the short strap that hangs down the center of the dog’s chest. A lot of dogs act out on the walk and will roll around on the ground trying to get the head collar off. As an extra precaution, I will also use a regular collar and leash just in case that happens. One of my dog clients is a GoldenDoodle, very sweet, very playful and very comical. He loves to roll on grass and he can run like the wind. So, here is an instance where I prefer to pre-empt an unfortunate situation and use both restraints simultaneously. A dog’s nose is a very sensitive area so any correction must be done cautiously. Pulling hard on the leash and jerking must be avoided at all costs to prevent injury. As I said at the outset, be careful when using head collars (gentle leaders). 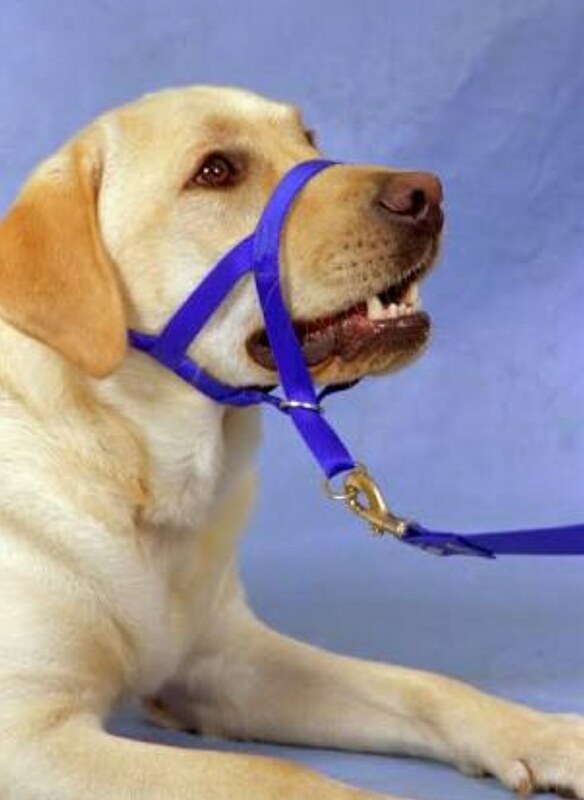 They only work well if both the walker and the one at the end of the leash are in harmony. Give it a try. It’s well worth the effort!